I missed a blog post by Satoshi Kanazawa about a month ago: Why Are Stepparents More Likely to Kill Their Children? In it, Kanazawa describes research carried out by a Swedish team that sounds pretty damning for what is one of the "foundational empirical findings" in evolutionary psychology, namely the so-called “Cinderella Effect”. The effect is that children are more likely to be killed by stepparents than biological parents, and the explanation that evolutionary psychologists have given is that this is because "stepchildren do not carry any of the genes of the stepparents, so there is absolutely no evolutionary reason for stepparents to love, care for and invest in their stepchildren." Science like that makes me vomit. Figuratively. First interjection: How can anyone with any knowledge of biology even write something like this? Stepchildren do not carry any of the genes of the stepparents, so there is absolutely no evolutionary reason for stepparents to love, care for and invest in their stepchildren. Wrong. On the semantic level: Stepparents share ALL genes with the stepchildren. All humans have all the same genes*. A gene can be approximately thought of as a sequence of DNA that codes for a particular protein. Many genes then come in different versions in the human population - they are called alleles. One famous example is the gene coding for Hemoglobin for which there are two versions, one of which makes sickle-celled Hemoglobin. This may seem like a minor mistake, and I am sure that Kanazawa knows the difference. But then, what sense does it really make to say that "stepchildren do not carry any of the genes of the stepparents"? Suppose we here substitute "allele" for "gene", is it then true? No, it is not at all. It's not just Kanazawa, of course. It is very common to hear people saying "each parent shares 50% of their genes with each child." But it's bogus, because we are all related, and there are many genes for which two random people will have the same allele. I am not saying that therefore parents aren't more like their children genetically than any random person - parents and children look alike for genetic reasons, of course. But it remains that the statement as given is factually false. Let me just remind you that when people speak of the genetic relatedness of humans and chimpanzees, then we are all of a sudden 98% (or whatever) identical. Taken together, these statements of course make no sense. Apples and oranges. Second interjection: It does emphatically not follow that there is no reason to love, care for, or invest in children that one is not the parent of. Not even in evolutionary terms. Humans cooperate, and in evolutionary terms it potentially benefits a parent to care for stepchildren in many ways. How about protecting each other? Stepchildren caring for children, for example. I know the story of male lions taking over a pride and killing the cubs that aren't theirs, so that the females come into estrus quicker, and in the light of this, the hypothesis that parents are more likely to kill their stepchildren than their own children does make sense. But always watch out for "making sense". My high school physics teacher liked to tell how "common sense" had been put into an urn and shelved away so that it may not delude the scientist. Third interjection: The Swedish team examined data that suggest that stepparents are from the beginning more likely to be violent, and Kanazawa readily admits that this could explain the "Cinderella effect". Single mothers perhaps aren't the kind of women in the highest demand, and neither are violent males, so it seems like a good hypothesis that stepfathers are more likely to be violent than the average male. And this is the problem: If one evolutionary psychology hypothesis - trusted and expounded for many years - cannot explain the data, then it is dead easy to come up with another that can. And that's the danger of how evolutionary psychologists practice science. It's not that studying human behavior is not good science (it is). It's not that the link between genetics and behavior is bogus (it isn't). 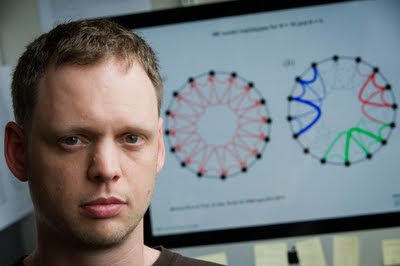 It's the readiness to attribute an evolutionary explanation to psychological data that is problematic. Not because such explanations can't be true (and in some cases they likely are), but because of the ease and certainty with which "common sense" is applied. This sordid affair is a perfect case in point. The only major weakness of Temrin et al.’s study, which the authors themselves openly acknowledge, is their extremely small sample, taken from one small nation. There just aren’t many homicides in Sweden, child homicides or otherwise. So their findings must be replicated, with larger samples and in other societies. But, at the very least, their paper has begun to throw one of the foundational principles of evolutionary psychology into possible doubt. In my experience, this is the first and (so far) the only study ever to do so. If their findings are replicated, and if their explanation for the greater risk of homicide faced by stepchildren is true, then Hans Temrin and his colleagues have secured their places in the Evolutionary Psychology Hall of Fame for their act of successful academic regicide. Kanazawa writes this apparently without any kind of reflection, which I think is appalling. 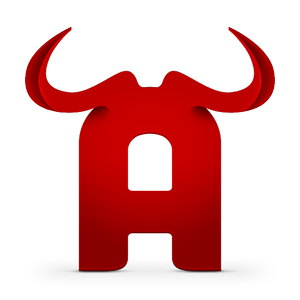 * There may be super rare cases where a whole gene is deleted or added in offspring. First of all, the gene/allele confusion is partially a problem of differing terminology among fields. From an evolutionary biology perspective, you are strictly right of course. There are other disciplines, however, when "gene" is almost always used the way that an evo-biologist would use the word "allele", not because there is confusion over the two, but because that's what they call it in that field. I only know this because in The Ancestor's Tale, Dawkins has an early digression to explain that he's going to use "gene" in the way that evo-biologists use "allele", because that's how ethologists do it, and if you're bothered by it, just pretend he said "allele." That said, I would think that evo-psych would want to keep their terminology as close to evo-biology as possible, so if they aren't using gene/allele the way you are, that's probably not a good thing. It is very common to hear people saying "each parent shares 50% of their genes with each child." But it's bogus, because we are all related, and there are many genes for which two random people will have the same allele... Let me just remind you that when people speak of the genetic relatedness of humans and chimpanzees, then we are all of a sudden 98% (or whatever) identical. 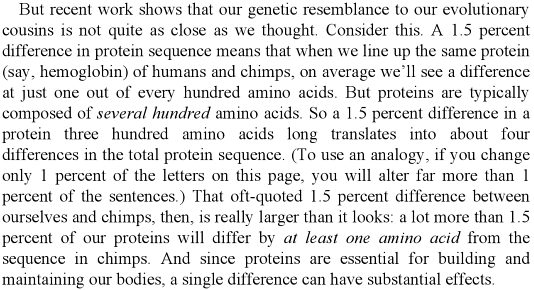 This is a little unfair, because the early part of the paragraph makes it sound as if you are talking strictly about matching alleles, but the "98% (or whatever)" number you refer to is in regards to base pairs. 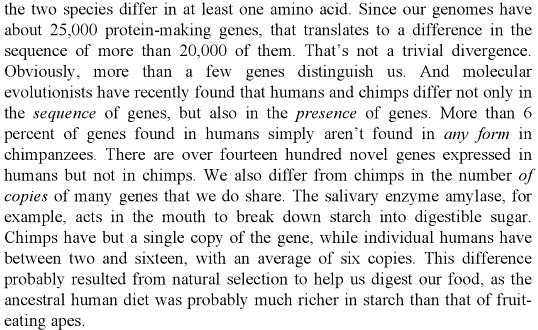 IIRC - and I may not, so take this with a grain of salt - someone did a recent estimate of the percentage of alleles that are shared between humans and chimps, and it's more like 70% or something. Considering that the allele for sickle cell anemia (for example) arises from the modification of a single base pair in the beta-globin gene, I think that counting base pair matches is highly misleading (with the exception of forensic DNA analysis and the molecular clock, which are special cases). Semantic quibbles aside, I'm more than done with Kanazawa. He's a provocateur and a sloppy scientist, IMO. Now, nothing wrong with being provocative per se, but when you're full of crap besides, it's just annoying and counter-productive. Okay, I concur. 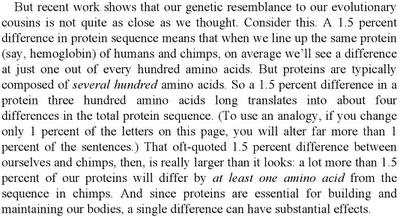 As for the sentence about chimps, I added that just to emphasize how confusing talk about genetic similarity is. 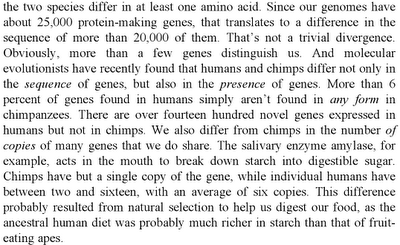 I have now uploaded text from Coyne's Why Evolution Is True about human-chimp genetic similarity (see original post). Another assumption that an economist (who's bragged of having no more than high-school biology) would make is that in every regard except genetics step children would be identical to biological parents. And yet my observations of step children suggests that (social) animosity, and resulting unsociability, towards step parents can be very high as well. Anyway, while I'm willing to be open minded about this murderous step parent effect I think you'd need much larger sample sizes to definitively factor out other potential factors... and account for the adopted-child issue as well. If common sense was a reliable guide to reality then we wouldn't need science! That's a very good point about adopted children. I wonder if there's data on that. The whole thing seems so poorly thought out that it is appalling that it became foundational for evolutionary psychology. Stepparent homicide is, of course, very rare, even though it is much more common than natural parent homicide. So, it doesn't seem shocking that a little bit greater homicide rate could flow from a little bit greater degree of genetic dissimilarity. I also like to think about evo-psych heuristics less as actual causes than as hypothesis generators that suggest fruitful phenomena to investigate and Baysean expectation generators about how those phenomena actually play out. We can say with great confidence that stepparents who kill their stepchildren are almost universally not sitting up at night considering their allellic legacies when they lose control. Instead, there are instinctual and cultural traits that have evolved that happen to have the incidental effect of making stepchildren more vulnerable to being killed by stepparents than natural children are to being killed by their natural parents. Instincts and cultural practices that lead to selective fitness survive and continue to be present. Those that do not tend to be short-lived and removed from the species and culture respectively. If an evo-psych heuristic is a fit to the data, then the odds that the important factors in the situation have been observed and that the situation is understood is likely to be good. If a common sense evo-psych heuristic predicts something different then what you observe, then there is a very good chance that you need to look more closely at the situation and may be missing some important element of the situation. Viewed as a tool to guide psychological hypothesis formation and to suggest whether further research is required for a phenomena, evo-psych common sense does a much better job of living up to its purposes than as a theory that can actually predict outcomes in the absence of experimental follow up. One more nit on word useage. Regicide is, of course, the killing of kings. Patricide is the killing of fathers (also probably more common in stepparent cases, but not what is discussed here). Filicide is the killing of one's own children. This is arguably filicide, but is certainly not regicide. Regicide here refers to the demotion of the originators of the Cinderella Effect.